Starting 2012 with an Ooh-Rah Spirit! Welcome Home the Heroes Parade! Volunteers in the City of St. Louis, Missouri are coming together to make this Saturday, January 28th "Welcome Home the Heroes Day!" The parade on Saturday aims to help our heroes celebrate their return home and thank them for their service abroad. The parade will be the first step in thanking our Veterans as well as challenging them to continue their service as leaders at home, while providing them with the resources and opportunities to successfully transition to civilian life. The parade will start at noon on Market Street in St. Louis, and your help is needed as a volunteer or organization to be a part of it! It's not too late to find the PERFECT Valentine's day gift! A bling lapel so she can show her pride in style! Laptop sleeves share a message wherever you go! He'll love checking the time with our sporty watches! The new year is here, along with our 9th anniversary, so we are celebrating with a new look! We look forward to continuing the good works of supporting families and Marines through the many outreach programs of Marine Parents for years to come! Click here to read the story of our new logos! We'll tell you about some helpful resources for Marines, Veterans and their loved ones, including a database to reconnect with other service members and a fun way to celebrate birthdays with USO Okinawa. We also have information on the Marine Aviation Centennial events coming up, and a great story of how a family spends their Christmas each year. We just celebrated our ninth anniversary with a very successful Care Package Project™ pack day and Souper Heroes campaign! It was a wonderful, inspirational day working beside over 100 volunteers to send our heroes overseas some love. Read more about it below! Team Marine Parents™ Events Open for Registration! How is your New Year's resolution to get fit this year going? Have you joined Team Marine Parents™ yet to stay healthy AND support our troops?.. Sound like fun? Click here for more information and events! The Lance Cpl. shows off his cake. If your loved one in the military is stationed in Okinawa, you may have a wonderful opportunity to help them celebrate their birthday! According to the United Services Organization (USO) website, USO Okinawa will order and deliver a personalized birthday cake to that someone special you're missing so much! Simply contact USO Okinawa two weeks in advance of the special day to request a birthday cake. On the individual's birthday, the cake will be delivered to your loved one for presentation. Marine Dad, Steve, and his wife know first-hand how great the Operation Birthday Cake program can be. They wanted to celebrate their son, a Lance Corporal's, birthday with a bright, creative cake bearing his nickname "Red." After delivery of the cake, Steve received an email from the program coordinator telling him about how the presentation went, which made the experience even more special! You can help your loved one celebrate their birthday too! A big thank you to everyone who helped us exceed our goal for the SOUPer Heroes drive for our deployed Marines! Thanks to your support, we received donations for over 2,800 cans of Rich and Hearty Progresso soups. Volunteers helped pack two large cans in each of our care packages on Saturday, January 21st. We know our heroes will greatly appreciate this taste of home in their care packages, as well as knowing so many people came together to support them! A big ooh-rah to everyone who is helping keep our troops warm overseas this winter with a little taste of home! Stacy and Semper Gumby sharing smiles with the recruits. We recently received a wonderful picture from Mike of his wife, Stacy, wearing our Semper Gumby shirt! Mike and Stacy have an awesome tradition of spending Christmas morning visiting the sick and injured recruits at MCRD San Diego. The visits started eleven years ago and they have been present for nine of them! What a wonderful way to spread love and cheer. Thank you Mike and Stacy for your giving, Ooh-Rah spirit! Don't forget to send pictures of your loved ones showing their Marine Corps pride to lrv@marineparents.com! training, marking the birth of Marine Corps Aviation. Almost 100 years later, the integration of the air-ground team of the Marine Corps continues to make history through their outstanding innovation and transformation of aviation. 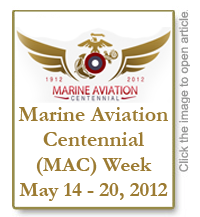 To close a year-long celebration of a Centennial of success and prowess, Marine Aviation Centennial (MAC) Week will take place May 14-20 at Gaylor National Harbor Conference Center. Care Package Pack Day a Success! The Marine pride filled the warehouse! reunited, new friendships were formed, the warehouse was filled with stories and laughter, and 1,350 care packages were filled with love and support from home. The Ooh-Rah pride filled the parking lot as cars from six states arrived, most bearing Marine Corps and patriotic bumper stickers (and one from Michigan bearing snow on its bumper, brr!). The day started with volunteer registration and breakfast, as an incredible 79 volunteers came to help send our Marines overseas love and support. These great volunteers were able to enter a free raffle while checking in, along with scan our new QR codes to keep up with all our programs, and meet one of our favorite new editions to the EGA Store: our cuddly, customizable bear! Our first corporate office blood drive was held on Tuesday, January 17th. Though it was a small turnout on the cold, blustery day, we collected enough blood to save over 24 lives! Corporate office girls show off their bandages! during the difficult winter months. Thank you for all your encouragement and support for this great cause, we'll keep you updated on our next event! We're excited to tell you about a useful resource for veterans and active-duty Marines available through the Marine Corps Association and Foundation. Together We Served is a website dedicated to helping all branches of military members reconnect and preserve memories of their service. TogetherWeServed.com is a safe, private site you must become a member of to explore and share. It has several elements members can take advantage of within their branch of service. Together We Served has an extensive database of over 320,000 Marines and has reconnected more Marines than any other military community website. We are proud to claim the title, of United States Marines..."
MARINE BASE CAMP PENDLETON, Calif. - On Aug. 26, 2009, Lance Cpl. Donald J. Hogan sacrificed his life to save fellow Marines, and earned the Navy Cross, the nation's second highest award for valor. Yesterday, the San Clemente native's family traveled here to receive the award from Secretary of the Navy Ray Mabus. Hogan's father and mother humbly commented on their son's achievement, noting his reluctance to accept personal recognition. "He was given an opportunity that very few of us get: to prove our mettle," said his mother Carla. "But, I don't want the guys who he was with to feel that, in some way, he was a superior (to them)."